These awards recognise the outstanding achievements of academic and professional staff in the key areas of research, teaching, engagement, professional excellence and strategic priorities in the fields of architecture, engineering, economics, commerce and business. We speak with Dr.William Ho, 2016 Edward Brown Award Recipient and senior lecturer in the Department of Management and Marketing at the University of Melbourne, about the award that pays tribute to his teaching excellence. While the Edward Brown Award is an acknowledgement of exceptional achievement, it is obvious speaking to Dr Ho that his engaging teaching practices are part of his academic DNA. “I always ensure [my] teaching and learning processes are more interesting, practical, engaging, and supportive" says Ho, who has introduced a number of student-centred innovations into his teaching methods. 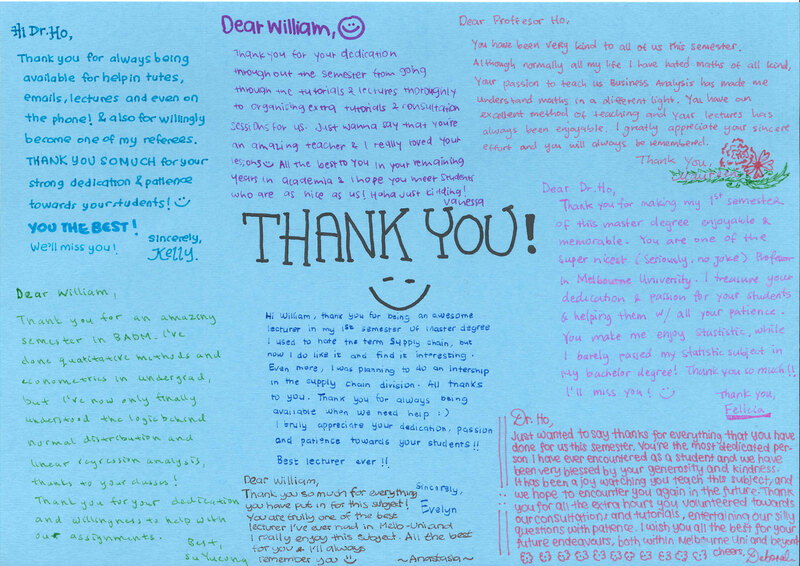 "This [approach] motivates and inspires my students to learn actively." Dr Ho is no stranger to accolades, having received the Certificate of Excellence in Postgraduate Teaching in 2015, and the Aston Excellence Award in 2010. He credits his success to the introduction of up-to-date teaching materials, relevant to the latest business and research developments in his field of expertise. These vital tools are continuously employed in the classroom to ensure his subjects remain practical and current. There is also a strong emphasis on student participation in his classes. Using a variety of activities, case studies, calculations, and hands-on mathematical model formulation practice, Ho provides perspective on why it works: "I believe students gain most from learning by doing". 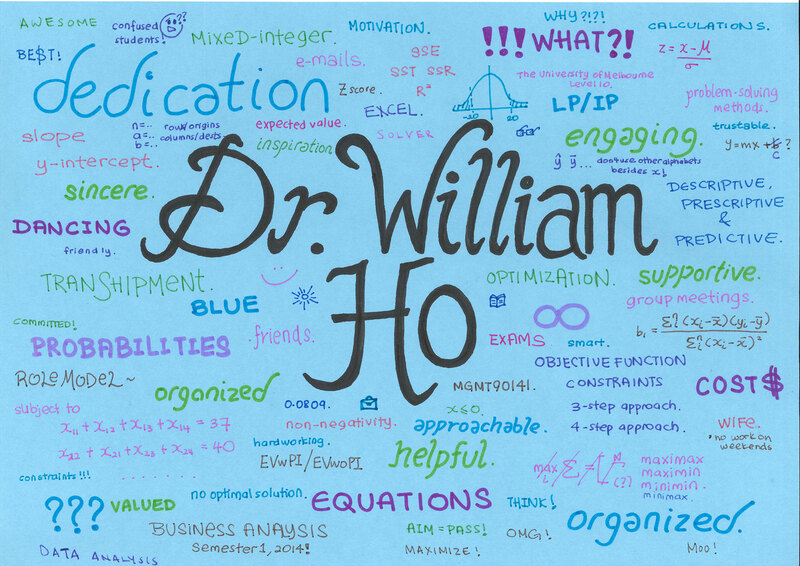 Beyond the classroom Dr Ho makes himself available for students, providing ongoing support and timely feedback that help to build student skills and confidence beyond learning processes to real-world applications such as delivering course tutorials. He also contributes to "higher degree research training and development activities" and is currently mentoring three early career academics within the Department. As a student, did you have a teacher who motivated and inspired you? As a PhD student, my supervisor, Prof. Ping Ji motivated and inspired me a lot. He was always efficient in giving me feedback on my research, and his feedback was always effective. What is the one teaching method you have found inspires your own students the most? My pedagogical approach has been guided by Phil Race’s successful learning model (Race, 2005), which suggests five critical success factors in the learning process, including 1) wanting to learn, 2) needing to learn, 3) learning by doing, 4) digesting, and 5) feedback. I have adapted and implemented the model, and proved it to be effective in a variety of my subjects taught in various institutions since 2005. Having a mentor as a student &/or young professional provides a wonderful development platform. What are your 3 tips for selecting a potential mentor? The mentor must be eminent in the discipline (teaching and/or research). The mentor is accessible and able to provide timely and effective feedback. The mentor-mentee relationship would work best if they have mutual interest and willing to work closely together. Dr Ho will continue to expand and explore his current research interests that include strategic sourcing and supplier performance management, supply chain risk management, and sustainable supply chain management. 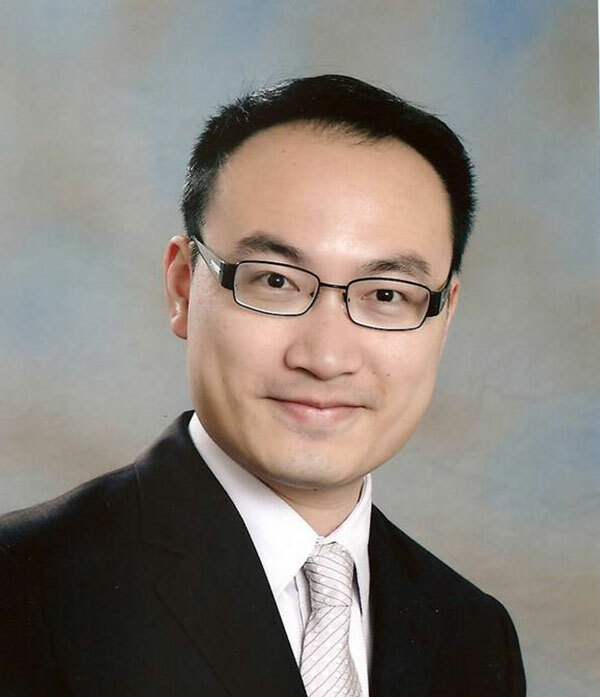 Dr William Ho joined the Department of Management and Marketing at the University of Melbourne in 2013. Prior to that, he also taught at Aston University (UK), the University of Regensburg (Germany), Vienna University of Economics and Business Administration (Austria), and Rouen Business School (France).